Many underlying health conditions can cause changes to the appearance of your toenails - it isn't always fungus! There are a lot of people out there, hiding their nails in closed-toe shoes. They are embarassed of the appearance of the nails and don't want to feel that they are being judged or that people will be talking about them. Many times the embarassing appearance of your nails is due to a fungal infection - but sometimes it's not! We have seen many patients that seek treatment of fungal nails and when we see them in our office we find out that a treatment with anti-fungals will not help. There are times when the changes in the nail are not typical for nail fungus and then there are times when we'd bet money that the nails are fungal and they turn out not to be. There are quite a few different causes for the change of appearance in nails. In our clinic, we perform a debridement (or trimming) of the affected nail and send it to a dermatologic pathology lab which reviews the nail under a microscope and also performs a fungal culture to definitely diagnose the cause of damage to the nail. Once we have this information, we can cater treatments and also discuss the level of improvement to expect with the given treatment plan. The following are conditions (other than fungus) that cause changes in the appearance of nails. * Psoriasis can cause many changes to the appearance of nails. When there is already cutaneous psoriasis present (patches, etc. ), nail changes can also occur. The nails can pit and become brittle. 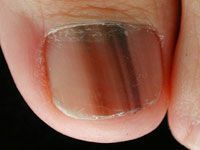 A translucent yellow-red discoloration underneath the nail that looks like a drop of oil is the most diagnostic sign of psoriasis in the nails. Leukonychia means that the nail appears white in some areas and this is another signs of psoriasis as it presents in the nail. The nail plate can also lift due to weakness of the surrounding structures of the nail or begin to crumble due to the underlying psoriasis. * Rheumatoid Arthritis can also cause changes in the appearance of nails. Yellow nail syndrome in some patients with rheumatoid arthritis can be due to use of rheumatological drug called a thiol drug. An example of this is gold sodium thiomalate. Other conditions that can cause yellow coloring of nails include chronic bronchiectasis or sinusitis (respiratory diseases), internal malignancy, pleural effusions (fluid around the lungs), or other immunodeficiency diseases. * Hyperthyroidism can cause the nails to turn to a brown coloration. It can also cause the nails to separate or lift from the underlying nail bed. Lifting of the nails (also called onycholysis) is commonly seen with fungal infection in the nails. However, yet another possible cause of the nail lifting from the nailbed is a wart underneath the nail. * "Beau's lines" describes the appearance of nails when they have lines across them and can look like a crack or depression of the nail. These lines are caused by a disturbance in nail growth. The growth of the nails can be disturbed by trauma to the nail bed, cold exposure, Reynaud's disease (also cold related) or any other episode of serious illness. * Trauma can cause thickening, discoloration and loosening of the toenails. Sometimes acute trauma causes a collection of blood underneath the nails, called a subungual hematoma. While this is usually more easy to diagnose, there are many times when long-standing microtrauma can cause the nails to look thick, to be brittle and to be crumbly. Repetitive microtrauma can be something as simple as wearing shoes that are not the right size. The shoe may be too tight, causing the tips of the toes (and therefore the toenails) to bump against the end of the shoe. This pushes the nail bad into the area of growth cells under the cuticle and if this occurs long enough, the growth cells become unable to produce a nail of normal thickness and appearance. * Dark lines that appear from the cuticle to the tip of the toe can be a normal color change in dark-skinned individuals. However, these lines must be differentiated from a condition known as subungual melanoma. Subungual is a term refering to the skin underneath the nail. Melanoma is a type of skin cancer. This is a big reason that dark lines in the nail that do not resolve as the nail grows out should be biopsied to definitively diagnose their cause. It is easy to see from the information above that changes in the appearance of toenails (and fingernails) can provide information about many underlying issues in the body. If you have concerns about why your nails have changed appearance, make an appointment to see one of our doctors today!